Water, a most mundane substance (or is it not? 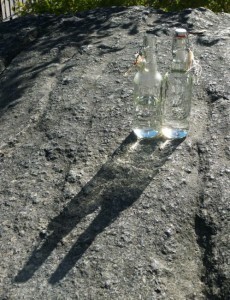 ), here captured in bottles and glittering in the sun. 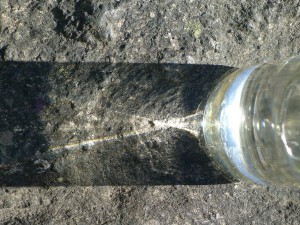 The water flashes in the bottle, refracting the light from the sun. Veiled behind drops of condensation, a small pocket of air resides, between the surface of the water and the cap. Silvery, with a magical shimmer, water can sometimes look almost otherworldly. Like the healing elixir, brought to the companions of King Arthur, from the misty realms of Avalon. The idea of some waters having a healing power can be traced back at least to ancient Greece. Equally old is the idea that hands-on healing (laying on of hands) may have a healing effect. In the 1960s, the Canadian biologist Bernard Grad (1920-2010) decided to investigate if the process of hands-on healing would affect living plants. A test subject – a known “healer” – would hold pots with barley seeds (planted in soil) for thirty minutes. Afterwards, the sprouting and growth of the seeds would be measured for 14 days. But healthy barley seeds being treated showed no difference to an untreated control group. The idea then arose that treatment of unhealthy or damaged seeds would respond more to the healing treatment. In a new experiment, a one percent salt solution was poured into the pots on the first day of experiment, creating a salty soil, difficult for the seeds to thrive in. The pots of one group were then held by the healer for half an hour, the others not. During the next 14 days, the pots were watered with ordinary water. The barley in the treated pots sprouted more seedlings, grew faster, and produced more plant material, clearly having been affected by the treatment. It seemed to be an effect from the hands or body of the healer that somehow was transmitted to the plant. But what was the mediating factor? Grad decided to modify the experiment somewhat. Instead of holding the pots with the barley seeds, the healer would hold the salt solution before it was poured into the pots. These experiments showed similar results, indicating that it was the salt solution that somehow was affected by the healing process and mediating the effect to the seeds. But could the effect on the salt solution be measured? When Grad investigated the solutions’ ability to absorb infrared light, he found that in the salt water sample that had been subjected to healer treatment, the absorption of some wavelengths (around 2800-3000 nm) were affected. The treated water thus responded or resonated more to that specific radiation. How this would create better conditions for the plants we still don’t know. Later, the British physical chemist and parapsychologist Douglas Dean (1916-2001) would continue the research, examining the effect of healing on distilled water. He found a similar, reproducible, effect of healing on the infrared spectrum of distilled water. The absorption effect in the treated water would decay slowly over time, the difference in absorption halving in about 2-3 days. If the bottles were only partially filled with water when treated, leaving some air in the bottle, they would produce a stronger effect that would persist longer, indicating that water and air somehow interact in the process. How the bottles were held during the healing process would affect the water. For example, holding the bottle close to the throat would create a stronger effect than holding it close to the trunk. Inspired by the results, Dean would investigate waters from traditional healing wells, such as the crypt of Lourdes, Glastonbury, Bath, and Wells, and measured a similar absorption, which ordinary drinking water would not show. Sometimes though, the effect would turn up unexpectedly, like in a well at Scottish Findhorn. Stretching for the bottle, my thoughts drift to the healing elixir of the legend. Maybe the mist of Avalon is swirling in the bottles, after all. In 1981 Douglas Dean received several water samples from a newly drilled well at the Universal Hall (close to the entrance at the left side) at Findhorn in Scotland, which displayed a peak in the infra-red spectrum similar to the healer treated water. This prompted him to investigate well waters from traditional healing wells in Britain, including well water from Bath, Wells, and the Chalice Well at Glastonbury. They all displayed the effect, whereas ordinary tap water, e.g. from Kings College in London did not. He got many samples of spring water taken from the renowned healing center Lourdes in France which didn’t show any effect, though. Later he measured the effect in water sampled directly from the spring in the crypt of Lourdes. He concluded that the Lourdes water in the basins publicly available probably was diluted with rain water, given the large amounts of water sampled by pilgrims compared to the gentle flow of the spring in the grotto. Grad, B. A. A telekinetic effect on plant growth: II. Experiments involving treatment of saline in stoppered bottles International Journal of Parapsychology, Vol. 6, 1964, p. 473-478 & p. 484-488. Grad, B. A., & Dean, E. D. Independent confirmation of infrared healer effects [Abstract] In R. A. White & R. S. Broughton (Eds. ), Research in parapsychology 1983 : abstracts and papers from the twenty-sixth annual convention of the Parapsychological Association, Scarecrow Press, Metuchen, p. 81-83. 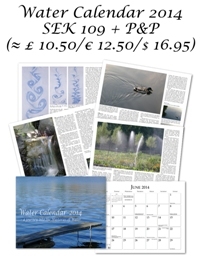 This entry was posted in Water Calendar 2014 and tagged alternative quality measurement, alternative water treatment, Avalon, Bath, Findhorn, Glastonbury, healer treated water, healing, healing wells, infra-red spectra, Lourdes, Wells. Bookmark the permalink.